Ashville High School, Ashville, Pickaway County, Ohio, ca. 1900-1909. Although there were a number of high schools located across Ohio in the nineteenth century, there were no laws governing these institutions. That changed with the passage of the Brumbaugh Act in 1902. Progressive reformers in the late nineteenth and early twentieth century were involved in a number of important educational reforms. The Brumbaugh Act was one example. The law created a formal definition for high schools that set them apart from elementary schools. High schools were divided into three distinct categories, which each had specific standards. The first category included high schools that contained four grades, were open thirty-two weeks each year, and required at least sixteen courses completed for a diploma. 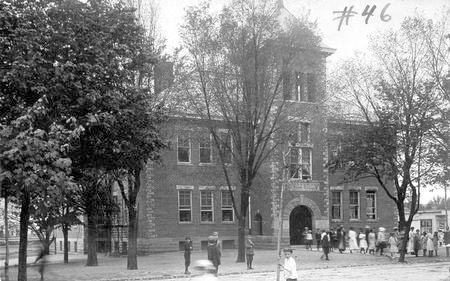 The second type of high school was also open for thirty-two weeks, but only had three grades and required twelve courses to graduate. The final category was open for twenty-eight weeks each year, had two grade levels, and required eight courses for graduation. At this time, children were not required to attend high school. Mandatory attendance in Ohio would not be required until passage of the Bing Act in 1921.